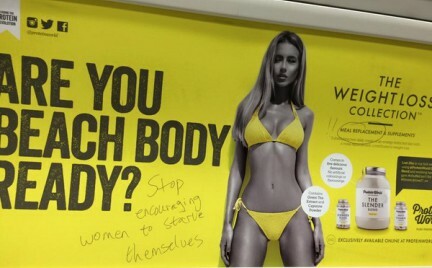 Now some of the protein powder dust seems to have settled on the Protein World advertising campaign, and much of the general public have forgotten about it and the outrage they felt about that message. So what's left? For us it has left a bitter taste in our mouths. To begin with, I was not personally offended by the advert as there are a vast number misrepresentations of people and products in the media, a topic that has been dealt with extensively elsewhere, and therefore needs no further exploration here. What really grinds my gears about the entire campaign, though, is the distinct lack of any kind of attempt to educate people about: why they would need these products in the first place; what supplementing is actually for; and the kinds of sports for which supplements might be beneficial/appropriate. This advert - like so many others - has targeted an issue that is mentioned repeatedly to personal trainers: 'I want to look good on holiday'. Despite the fact that many of my clients first signed up to training with BEAR Fitness for this very reason, something we pride ourselves on is educating clients, and I make it very clear at the beginning of my working relationship with any such client that there is more to all this than being ready for summer. What about being ready for life? Does this 'holiday-mentality' mean that it's OK not to bother with fitness in the winter? Knowing that you are improving the whole year round makes health and fitness become the integral part of your life that it needs to be as, lets be honest, you never know when you may actually need to be fit for something unexpected - and I'm even talking about those work nights out when you're called up for a boozy press up challenge, or when your children have volunteered you for an arm wrestle with one of the other dads! If you're health- and fitness-focused throughout the year, your lack of beach-ready feeling can never stop you acting on that 'I’d love to get some winter sun' impulse, rather than being haunted by all too frequently present thoughts such as ‘I just can't, I am in bad shape’. Don't waste your time hiding behind poor health and excuses, and actually commit to a better lifestyle - and a better life. Another problem with the world of supplements, not just Protein World, is that food, funnily enough, is great for you. It offers you so much more than just the vitamins and chemicals in the supplements. Don't get me wrong - I do use supplements for their sheer convince. However, I could certainly live without them and I don't use them to deprive myself of food; I use them to be able to exercise intensely. I never, ever starve myself or skip meals or 'eat clean’ - whatever that means! You do not need Protein World to be in ‘good shape’ - whatever that may be for each individual. Even the model in their campaign is vegan so doesn't use the products (if you class her as 'in shape' - I won't comment).